A complete beginner’s guide to the sit-on-top kayak. Sit-on-top kayaking is fun and easy to learn. Anyone can do it! Paddlers, newcomers and those curious about the sport will find all the answers to their questions in this book. Using colour photos and clear descriptions, this book is the perfect introduction to sit-on-top kayaking. Choosing the right kayak, how to store and transport it, how to get the most fun out of your boat and how to stay safe whilst doing so are explored in detail. British Canoe Union Level 5 Sea Kayak Coach and Director of Jersey Kayak Adventures Ltd, one of the leading specialist sit-on-top kayak outfitters in the United Kingdom. Derek has kayaked for over forty years. He first learned to kayak around the incredible coastline of Jersey in the Channel Islands (which has some of the largest tides in the world) after his father built him a sit-on-top kayak. He has undertaken many kayak expeditions, most notably a circumnavigation of Ireland in fifty-eight days and expeditions to Alaska, Canada, as well as whitewater kayaking in Nepal. Closer to home he has paddled extensively in the Channel Islands including thirty-five mile open crossings. He has kayaked most of the best coastal spots in the UK. In his younger days he was a member of the Jersey surf kayak team and has been active in coaching sea kayaking in Jersey. Active in other sports too, he undertook a 12,000 mile cycle tour in 1984 and also is a keen skier and walker. In 2004 he set up Jersey Kayak Adventures to offer tours and courses to cater for the growth in this popular sport. 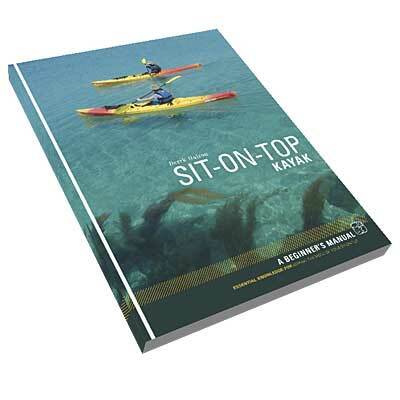 This is a complete beginner\’s guide to the sit-on-top kayak. Sit-on-top kayaking is the fastest growing water-based activity. It\’s fun and easy to learn. Anyone can do it! Paddlers, newcomers and those curious about the sport will find all the answers to their questions in this book. Using colour photos and clear descriptions, this book is the perfect introduction to sit-on-top kayaking. Choosing the right kayak, how to store and transport it, how to get the most fun out of your boat and how to stay safe whilst doing so are explored in detail. Snorkelling, fishing and scuba diving are some of the other activities that benefit from using sit-on-tops and these are also covered. Physically, the book consists of thin card covers printed in full colour. The front and rear carry photographs and the inner covers carry advertisements from two of the main distributors of sit-on-top kayaks in the UK – Ocean Kayak and Wilderness Systems. Further adverts are printed in the rear including the authors own kayak touring business. And why not! As far as I’m concerned this helps to establish his bonafides as a full-time sea kayaker and adds authority to his words. Having some experience in publication I am fully aware of the economics of book production and this is an excellent means of ultimately producing a better quality book for the price as the thick, high-quality matte paper and the full-colour printing throughout does not come cheap. For the reader there is also a good choice of companies listed which can provide further reading if the spark is fanned into the flames of desire! The layout of the book is very clear. A sharp, clear font with easy-to-read line-spacing and a large amount of clear, sharp, well-exposed and colourful photographs gives a feeling of brightness to each and every page. The graphics are simple and well suited – sharp edged photographs occasionally having rounded corners or the application of a drop-shadow, some rapidly faded into the page or cut out. They each come with their own descriptive captions printed in the same size and style of font in blue so they can be easily distinguished. Anything of particular note (especially safety orientated) is drawn attention to by the use of a green sticker-shaped box. Some illustration is also to be found amongst the pages and again this is clear and concise. The text itself is broken up into easily-digestible amounts of a paragraph or three and good use of headings and sub headings is made. Additionally, the front features a full contents page and the back a glossary (and links to useful websites). Overall, it’s a very nice-looking book that feels like a quality product. Thumbs up so far! Now for the content, the important part. Getting Started gives advice on buying, hiring, tuition, storage, transportation and accessories. The text is concise and gives a general overview of each part. More attention is paid to paddles, however, which is the most important accessory to any kayak. Choosing the correct length and type/size of blade is well covered along with paddling styles, blade angles and shafts. This is followed by clothing and related things to be aware of such as water temperature, windchill, sunburn, hypothermia etc. This leads nicely into the protection element of helmets and flotation and onto kayaking with children. Getting Afloat. Techniques for warming up, lifting and carrying technique, entry and launching are all described before the author begins instruction of paddling technique. Here the photography is well chosen and laid-out alongside the text as all parts are covered in an easy to follow manner. Not content with standard advice, the author continues with paddling in strong winds and advanced paddling techniques for turning, steering, reversing, stopping, edging, moving sideways and using the paddle as a rudder before continuing with support strokes and bracing. River Paddling. Here we find bits about bends, drops and weirs, river grades and river levels. This is only a short section as there isn’t really a lot to say. It doesn’t cover white-water (for which a Sit-on-Top is an unsuitable craft) or touring but neither are really in the remit of this book – it is a manual, not an encyclopaedia! Here the book begins to breakdown into the smaller, miscellaneous sections that have a following yet don’t warrant a detailed chapter to themselves. First off is a short section about diving from kayaks followed by another regarding fishing from kayaks. Both provide basic introductions but in fairness these are specialised areas. Some accessories are mentioned though which gives the opportunity to mention GPS, Fishfinders and Sea Anchors. The book finishes with a piece about the environment and a general closing statement about sit-on-Top kayaking in general. So, having had a brief tour and description of the book it is time to provide a personal opinion. This is always difficult with books as style is as important, often, as content from the reader’s point of view and there are often temptations to forgive one poor one if the other is good. In this case there is no reason to do so as content and style are both well-suited to the final product and the author’s passion shines throughout. It is not an advanced manual for sea kayaking but doesn’t claim to be – ‘A Beginner’s Manual’ is its title and it fills exactly that role. This doesn’t mean it’s overly basic or of no use at a later stage however as it will take the raw beginner, show the necessary tips and, if all is absorbed, this should leave the beginner (with time on the water) effectively at intermediate stage. The content is sufficiently detailed to be able to take note, apply and fulfil each application but is also described in such a way as to be memorable too. Where greater detail is needed on any points this is also given and the general feeling is that nothing for the newcomer is left out and neither is the reader bombarded with too much information. So, is it a worthwhile purchase? At ten quid even half this book would be worth the money so to recommend or not is irrelevant. The fact is, it’s a cracking book and its purchase would not be regretted by anyone at the beginner or intermediate stage and would still be enjoyed by the more advanced paddlers of these craft. I enjoyed it so much I finished it in an evening before re-reading it again and constantly refer back to it. Bring on the advanced manual Derek – Thumbs up!